We realize the title of this piece must come as a shock to most readers who are convinced there is nothing worth keeping, let alone exporting, about Indian cities. We cannot blame them: our major cities rank among the most polluted in the world. They are serviced by hyper-crowded public transport and jammed by an ever-increasing number of private cars. They are noisy as hell and equipped with poor infrastructure. They are also run by inefficient bureaucrats and corrupt politicians. Left to themselves, those who can afford it retreat into colonies – abandoning the rest of the city to its tragic faith. While all of the above is true, we take the risk of sounding hopelessly optimistic and share a few aspects of Indian cities that actually inspire a new generation of architects and urban planners. Indian neighbourhoods are usually bustling with economic activity: retailers, service providers, artisans, tiny factories and wired businesses for starters. The less planning there is, the more mixed the types of use seem to be. This produces a lively street scene, with eyes on it, which keep a higher modicum of safety then we would ordinarily expect –true to the observations of Jane Jacobs. Most Indians take this for granted, but contrast it with American cities where pedestrians are considered suspects first and foremost, or European cities where opening a small vegetable stand on the sidewalk or selling homemade dabba is harshly reprimanded. Indian cities are incredibly entrepreneurial by any standard. The scale of businesses is often small and their efficiency not always high – but this is made up by low barriers to entry for newcomers. Think of small shops, realtors, mechanics, mattress-makers, carpenters and chaiwalas for instance. They provide an amazing range of services in close proximity to those who need it. What’s more – these small entrepreneurs are also a huge force in the construction industry. They make furniture, window grills, cut glass, install electrical systems, fix pipes, sell bricks and cement, and build entire houses, temples, mosques and schools. These activities constitute the backbone of the neighbourhood economy, and they create a fair share of local jobs. Such economic networks could well serve as a source of inspiration to cities elsewhere, rich and poor, who aim at promoting local development. Urban India is also home to the most diverse housing types, serving all kinds of needs at the lowest possible cost. First, there is what we call the “tool-house” – a small residential unit that also generates income for its residents through rentals, workshops, businesses or stores. At a time when an increasing number of people around the world work from home, Indian tool-houses, which come in all shapes and sizes, provide excellent architectural reference points for the integration of living and working at neighbourhood levels. Besides, Indian cities have also historically relied on two other typologies that are trending globally: the cooperative society and the chawl (or worker’s barracks). The former is simply a means for a community to pull resources together and develop a building with shared facilities. It allows a larger segment of the population to access housing than would otherwise be possible if everything was left to real estate developers. Chawls were originally conceived to temporarily accommodate single men or young families who moved to the city to work. Big cities everywhere attract young workers who need affordable accommodations to set foot in the city rather than permanent housing. 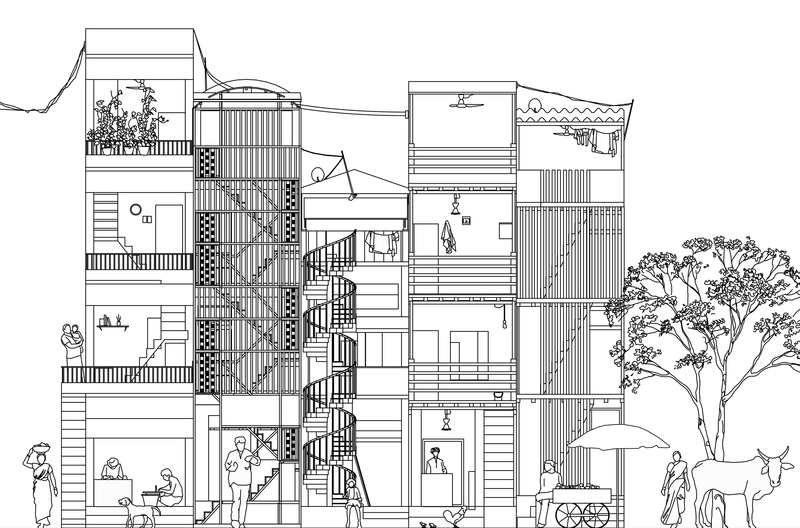 Chawl-like typologies are being reinvented in New York or Paris – looking at their evolution in Mumbai in the past century or so, can help us imagine how they could evolve elsewhere. There is another aspect of Indian cities that could inspire a new generation of urban planners and city officials: community participation. Communities are complex social arrangements with historically oppressive and divisive dimensions. But in some modern contexts, they also have provided foundations for self-development and mutual-aid – producing cooperative societies, hostels for the youth, schools, community spaces and dispensaries. It may be worth the while for urban planners and policymakers to recognize not only what is dysfunctional in Indian cities, but also what allows them to cope and thrive.